Wondering where in the world do you find alpacas? Trying to figure out what to do with alpacas? Contemplating the tax advantages of owning alpacas? Fantasizing about your very own alpaca? 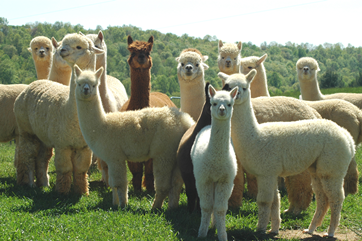 What are the different types of alpacas? When is a good time to invest in alpacas? Where do I go to see an alpaca? How do you care for alpacas? If you would like answers to these questions and more, then Alpaca 101 is ready for you. No games, no tests, just good solid information to help you understand why alpaca breeding has grown into a multi-billion dollar industry in a very short time. 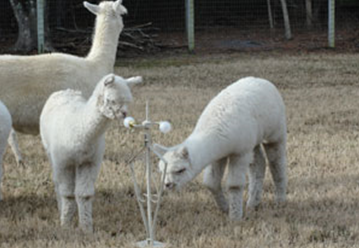 The alpaca industry remains stable and the tax advantages remain attractive. Please note that there are still wonderful tax savings in alpaca ownership. Please take the time to learn about these savings through your financial advisor or tax consultant. Alpacas (lama pacos) are members of the camelid family, “cousins” to the vicuña, guanco, and llama species of South America, and the Bactrian and Dromedary camels from Asia and Africa. This family of animals originated on the plains of North America about 10 million years ago. The South American story of alpaca started three million years ago when a wild form of “Hemiauchenia” migrated from Panama into South America. The “Hemiauchenia” flourished across South America and were ultimately the sole members of the camelid family. Eventual migration into the Andean Highlands developed two new strains, Palaeolama and Lama. These creatures were believed to have originated approximately 2 million years ago. The new genera was shorter limbed and changed their dentition (dental) to accommodate the their mountain habitat. Palaeolama spread back through the Pacific Coastline through Mexico and into Texas, Louisiana, Mississippi and Florida. The extinction of Palaeolam, and Hemiauchenia came around 12,000 years ago leaving only Lama, (the wild guanaco) and Vicugna, (the wild vicuna) in South America. Two wild species, vicunas and guanacos emerged. This Website is For Sale! Contact us.